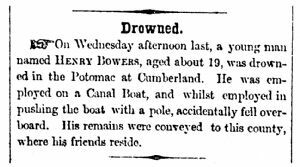 On Wednesday afternoon last, a young man named Henry Bowers, aged about 19, was drowned in the Potomac at Cumberland. He was employed on a Canal Boat, and whilst employed in pushing the boat with a pole, accidentally fell overboard. His remains were conveyed to this county, where his friends reside.